Though most hotels in Bangkok offer private limousine services or will at least assist with arranging transport, getting around Bangkok is fun, easy, very reliable and clearly geared toward tourism. 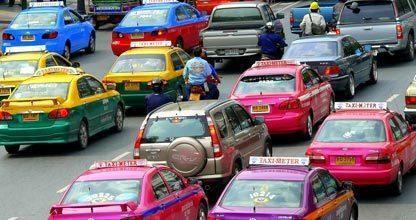 In fact, the many colorful transport options is a tourist attraction in itself. Below we have compiled a list of the different means to get from point A to B. And just make you feel a little more local we include a few Thai phrases to help you communicated with your taxi driver in his mother tongue. Though you will probably sound quite funny at your first attempts, Thais love foreigners making the effort, irrespective how hopeless it may sound. "mai chai" (no) kap cha" which means "go slowly" if he is driving to fast. 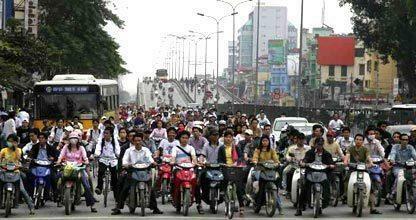 If you are not very familiar with riding a motorcycle in a busy city, stay clear of trying one out here. The city traffic is horrendous and driving a scooter here is hazardous. There are probably more taxis in Bangkok than New York and if you refuse the driver to charge his own inflated rates it is fairly cheap. Rates start at 35 ฿ and charged at 7-8 ฿ per minute. 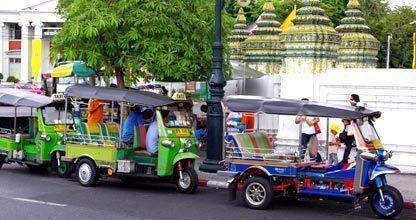 If you are visiting Thailand and do not take a ride in a tuk tuk, then you have not been to Bangkok. This colorful 3 wheel transport are everywhere and can take you to any destination the city faster than any car. 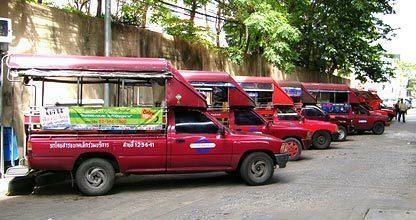 Songthaews are pick-up trucks and usually travel fixed routes for a set fare. They are the cheapest option, feels kinda original and authentic and you will be traveling with Thais making it even more special. Buses are cheap, safe and have a reliable schedule. The northern eastern terminal is on Kam Phaeng Phet 2 Road, with the Southern terminal located on Pinklao-Nakhon Chaisri Road. 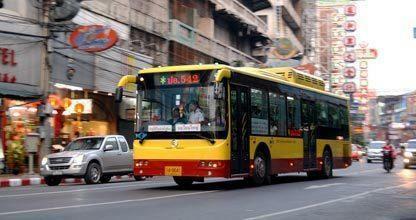 The Eastern Bus terminal is located on Sukhumvit Road. Motorcycle taxis are a common forms for public transport in Bangkok. Motorcycle taxi queues on many streets waiting for business. 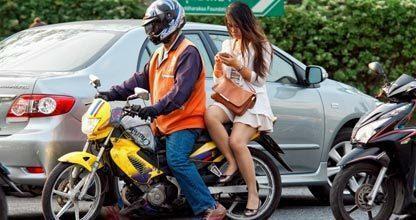 Licensed motorcycle-taxi operators wear orange vests. Prices are always negotiated since no fixed fees exist. The Bangkok BTS Skytrain is air conditioned, cheap, comes by every station every 5 minutes. Between the skytrain, MRT under ground and airport rail link which intersect at stations like Payathai and Siam they service more than 40 locations through-out Bangkok . Please refer to our Map of the BTS skytrain lines, the MRT and also the airport rail link for more information. 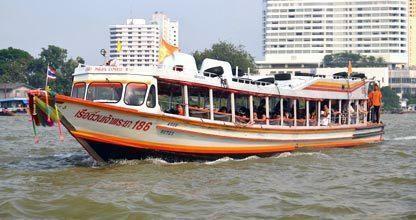 The Chao Praya Express Boat runs between Wat Ratchasingkhon and Nonthaburi. The Chao Phraya Tourist Boat travels along the Chao Phraya River and is a wonderful scenic and relaxed way to see and explore Bangkok. 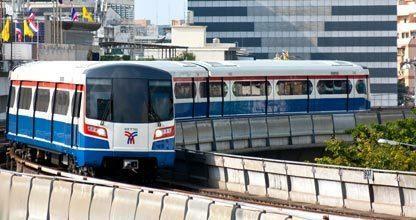 Take the skytrain to Saphan Taksin station. The pier is located where you exit the platform and boats come past to pick up commuters every 20 minutes or so at a nominal fee of a few Baht.